Have you ever cooked dinner in the dark?? Neither had I….until last night. Now, I’m not sure how EVERY SINGLE light bulb in my kitchen went out at the same time, but they did! Maybe the fluorescent light tubes do that? Anyone out there an electrician? No? Well, let’s get back to cooking. Thankfully, I have a small window that let a bit of light in from the setting sun. That, plus my oven light and I was in business! I needed something easy to make last night due to my limited visual capacity, thus the Kielbasa Veggie Bake was invented. This is very similar to the Sausage Skillet, but with some smokey roasted flavors. Brown turkey sausage in skillet over medium heat. Slice or roughly chop the vegetables and place on baking sheet. I just used what I had in my fridge. 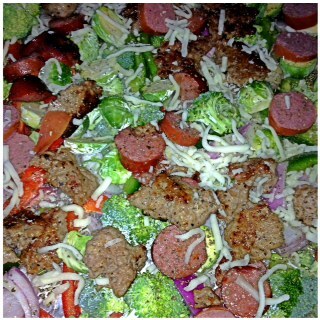 Add the kielbasa and turkey sausage to the baking sheet. Drizzle with olive oil and sprinkle on the garlic powder and mozzarella cheese.